Smith-Gilbert Gardens (SGG) has recently opened up a new and exciting area within its’ 16 acres of natural botanical beauty hidden off Pine Mountain Road in Kennesaw. According to the Marietta Daily Journal, this new permanent exhibit is being funded with grants from the Stanley Smith Horticultural Trust and American Conifer Society and completed by volunteers contributing more than 400 hours of service. The newly opened to the public “ Crevice Garden” will be the first of its kind in Georgia, featuring many new and exciting plants! 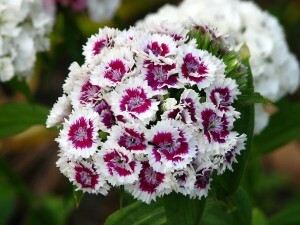 My favorite plant in the Crevice Garden is Sweet William Dianthus barbatus; native to the lower mountain ranges of Northern Europe and is one of over 300 species in the Dianthus genus, its botanical relatives are commonly known as pinks and carnations Dianthus caryophyllus. Rock gardens, and their not too distant cousin, the Crevice garden, can be traced back to early Chinese and Japanese culture. 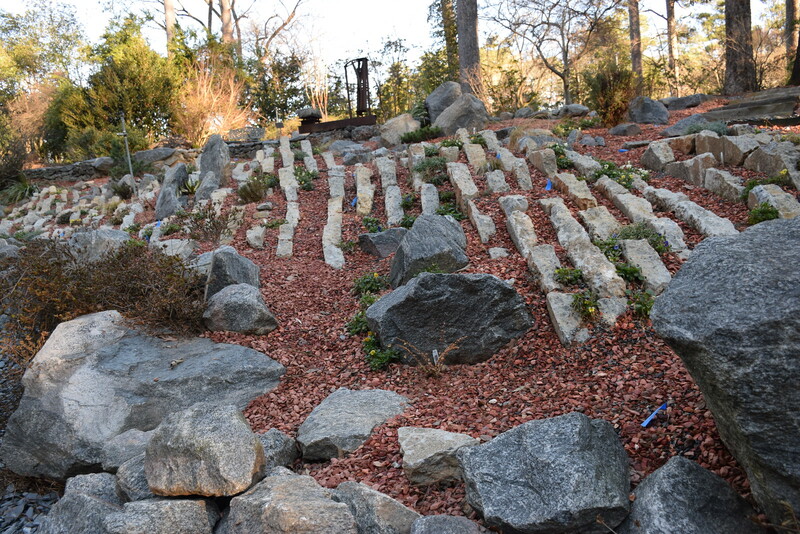 The focus in early Chinese and Japanese gardens was on unusual rock formations and not plants. The Taoist and Buddhist love for nature inspired the use of rock formations to invite mythological immortals down from their mountain dwellings into the garden. (Many years ago, I had the chance to climb up to the 4th Station from the top of Mt. Fuji in Japan and looking from this Station across vast forest tree tops, it did have a bit of a feel of mythical wonderment for Nature). Dr. E.H.M. Cox’s tome on historical botany in China outlines the tradition of mountain worship of rocks in gardens to recreate mountain scenes, and this Naturalist history is shown in rock gardens as early as the late Yin and early Zhou dynasties (1600 BCE – 771 BCE). According to historical records of the Zhou dynasty, the earliest gardens in China were vast parks built by the aristocracy for pleasure and hunting. Han-dynasty texts (206 BCE – 220 CE) mention a greater interest in the ownership of rare plants and animals, as well as an association between fantastic rocks and the mythical mountain paradises of immortals. Elaborate gardens continued to be built by members of the upper classes throughout Japan and China’s history. Traditional Japanese and Chinese rock gardens were meant to evoke a feeling of being in the larger natural world, so that the occupant could capture the sensations of wandering through the landscape. Compositions of garden rocks were viewed as mountain ranges and towering peaks; miniature trees and bushes suggested ancient trees and forests; and small ponds or springs represented mighty rivers and oceans…. the garden presented the larger world of nature in microcosm. Western interest in rock gardens dates to the 16th century in Europe, when explorers brought back exotic plants from the Americas and Africa. As Dr. Cox points out, during the European “Golden Age” of Botany (early 1700’s C.E. – mid 1800’s C.E. ), there was widespread interest in exotic plants and these became part of the Victorian rock garden. Inspired by mountain scenes, tundra plants were brought back from alpine regions around the world – examples are in the Himalayas in Asia, American Cordillera in North and South America, the Alps, the Scandinavian mountains, Pyrenees and Carpathian Mountains of Europe, the Caucasus Mountains, the Rift Mountains of Africa, and a large portion of the Tibetan Plateau. Northern European and English gardeners, tried to recreate these Native scenes using rockery, defined by Webster as “a garden or an area within a garden that has plants growing between piles of stones, typically using alpine region plants associated within the area.” Alpine plants are plants that grow in an alpine climate, which occurs at high elevation and above the mountainous tree line. Alpine plants are not a single taxon but many different plant species that live in the alpine environment. These plants include perennial grasses, sedges, forbs, cushion plants, mosses, lichens and others. In North America, (beginning in New England) rock and crevice gardens became a popular hobby in the late 1800’s until the 1930’s. 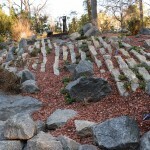 Americans competed to make the most unique rock and crevice gardens and they were popular because they were low maintenance and required little water. Another resurgence in interest took off in the 1960’s, and many of us may remember our parents building rock gardens (and if you remember this time in life, you certainly remember the “house broken” Pet Rock!). Crevice gardens are an excellent choice for steep hillsides and difficult growing conditions, such as poorly irrigated soil. They are low maintenance, and do well where water is a limiting factor. 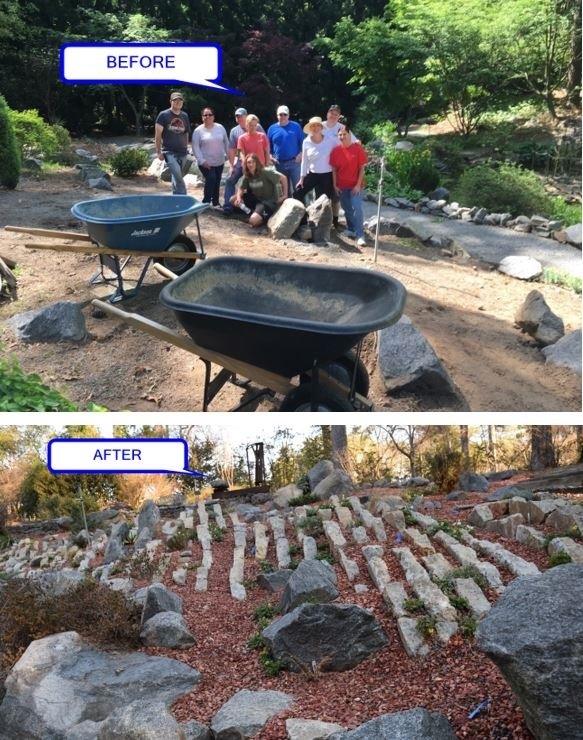 Rockery is an excellent way to use those rocks, boulders, cement pieces or chunks found on many properties. They can be used to control erosion and water run-off on slopes and are a good alternative in arid climates. Did you know… the world’s largest crevice garden can be found in Bangsbo Botaniske Have in the little town of Frederikshavn, Denmark? 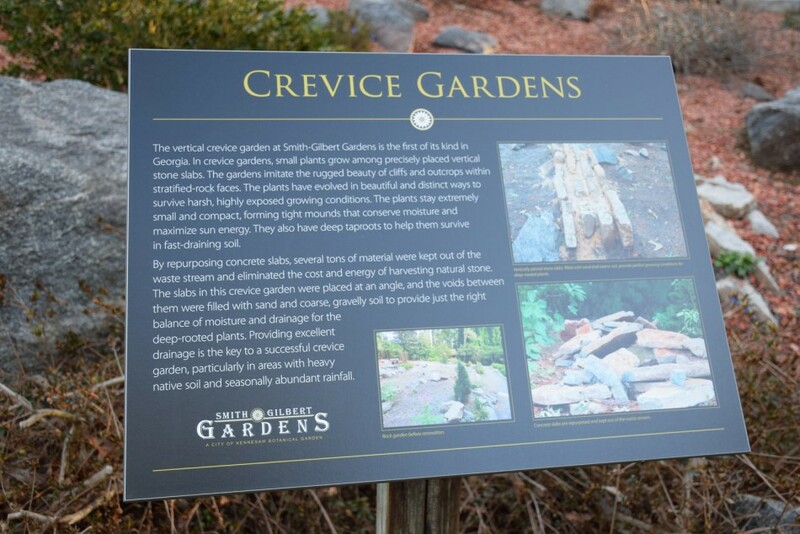 Why not save your money (or Delta miles) and stop by the Smith-Gilbert Gardens Crevice Garden in Kennesaw first and enjoy the true beauty that this botanical garden has to offer! By SGG volunteer John A Dolan, Ph.D. Thanks to SGG’s AMAZING volunteers!! !